“Getting Stronger” was our family’s third reunion in the last five years and unquestionably our most ambitious. 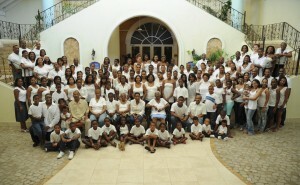 Our setting was once again the beautiful and child friendly Sunset Jamaica Grande in Ocho Rios. The months leading up to this year’s celebration however were marked by challenges created by an uncertain worldwide financial climate and a state of emergency in the Kingston area. A recession in America and many parts of the world created job losses and naturally had an effect on the number of family members able to commit to making the journey back to Jamaica. Additionally, the reunion date was on the heels of the surrendering of a drug lord whose standoff and civil unrest just a month earlier caused a travel advisory. Despite this, remarkably we still produced a reunion with approximately 200 attendees. This was a gift from above and a true testament to our desire to maintain the integrity of our timeless tradition. In attendance this year was the familiar faces. However, highlighting a new group were several members of Aunt Violet’s family line brought on by Lucila Welch and Ernesto Larrier. Also, we were joined by several members of Aunt May’s line brought on by Marcia and Angela from the Madden side. The itinerary for this year’s celebration was filled with activities for young and old. Each day we began the morning with your choice of a beach walk or aerobics. Also each day, we conducted dance rehearsals conducted by our friend and fitness instructor, Cynthia Herbert. Some highilghts for the major days of activities are detailed below. Our first big day of activities was Wednesday which held the Beach Olympics organized by Roneith Hibbert, our Couples Retreat organized by Gregory Hibbert and our Family History Review also organized by Greg. Congratulations go to the Victory Team coached by Mylinda Kerr for winning the beach Olympics. Congratulations go to Ernesto and Sarah Larrier for winning the couples retreat. The History review was interesting and it was highlighted by our new ability to trace a generation beyond Solomon and Elizabeth. Also, at the History Review, Kevin unveiled the beginnings of our family quilt with one of the first swatches contributed by Aunt Dee; a soft piece a fabric given to Veronica Neunie by her mom, Gwendolyn Hibbert over 30 years ago. 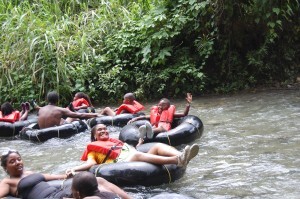 Our Family Excursion was fun as we went to both Dunn’s River and then on a River Tubing excursion on the White River. Later that night we had our Memorial Service organized flawlessly by Lorna Hibbert with contributions from several family members. A highlight was the children’s “Hibbert Poem” and the family tribute video. On Friday we had our Gender Retreat conducted by Wayne and Nicole Neunie and our Amazing Race conducted by Kevin Hibbert. Congratulations to Noah Hibbert and Ajani Kerr who successfully completed the amazing race questions before the other contestants. The Senior Circle organized by Kevin Hibbert was a great way to get the elders talking about issues in the family and the Family Forum conducted by the Reunion Committee was a great way to talk about our family aspirations. Later that night was the Awards Ceremony, organized by Dawn Hibbert-Wilson where we celebrated our Panamanian roots with Salsa Night! Thanks to the Kingston Salsa Dance Group who dazzled the crowd with their moves. Thanks to Eladio Garth from the SJG for being a wonderful host. The following family members received certificates: Mylinda Kerr for First to Register, Ernesto and Sara Larrier for Longest Marriage and, Andres Andrade for Most Reunion Spirit. Please click on the links above for more about these awards. On Saturday Uncle Ruddy took our Family Portrait, Marcia Madden taught the family the craft of honey making and delivered 150 bottles of her organic honey and the reunion was ended with Nathaniel Drysdale winning the fun filled Hibbert Idol.